As Trump plays waiting games with asylum-seekers, a good Samaritan gives them food, water, and hope. On a muggy June night, Luis Miguel Montimo turns away from the Gateway Inter­national Bridge over the Rio Grande and walks toward Matamoros, Mexico, carrying his almost two-year-old son, José Luis. The 32-year-old with a pockmarked yet boyish face has traveled from Honduras, where a gang burned down his home and killed two of his children. He hoped to cross into the United States to seek asylum. Yet when he reached the midpoint of the bridge earlier that day, an American border official turned him back. Montimo says the official told him that his son would be an adult by the time they were allowed in. Now, after a three-month journey, he’s ready to call it quits when a tiny woman wearing a red T-shirt and a concerned expression intercepts him. “Don’t give up hope,” Glady Cañas Aguilar tells Montimo as she puts her arm around his shoulder. “If you’ve made it this far, it’s worth staying until you can ask for asylum.” Sobbing, he walks back to join two other migrant families camped out on the bridge. It’s another busy night for Cañas Aguilar. She has already attended to about a dozen people stuck on the B&M Bridge a mile away. An inexhaustible 51-year-old, Cañas Aguilar has made it her mission to ensure that asylum-seekers are not thwarted by the Trump administration’s efforts to discourage them from entering the United States. Along with her daughters and a small group of volunteers, she comes to two of the main bridges that connect Matamoros and Brownsville, Texas, with everything stranded migrants need to survive: umbrellas to block the sun, medicine, tacos, water, and ice. She stays late into the night, tidy­ing up the makeshift encampments and providing the moral support that migrants often lack on their journeys north. And in the face of policies designed to deter them through deliberate indifference, she shows that compassion can be a form of resistance. Officials stand literally one step into the United States to tell migrants to wait on the Mexican side of the line in nearly 100-degree heat. The Trump administration has repeatedly ordered asylum-seekers to enter at official border crossings rather than try to cross the desert or the Rio Grande. Yet in May, Customs and Border Protection (CBP) officials began parking themselves midway across bridges along the border, standing literally one step into the United States to tell migrants to wait on the Mexican side of the line in nearly 100-degree heat. Those few feet make all the difference: Migrants cannot request asylum until they are physically present in the United States. Glady Cañas Aguilar comforts Luis Miguel Montimo on the Gateway Bridge. All along the border, from San Diego to Brownsville, asylum-seekers are told that CBP doesn’t have the capacity to process them. A CBP spokesperson says that letting everyone in “would compromise safety and impede CBP’s ability to carry out its border security and facilitation mission.” Jennifer Harbury, a Texas human rights lawyer, said CBP officials had “no answer” when she pointed out that the air-conditioned waiting rooms at the foot of the bridges are often deserted while infants sleep outside. Immigration advocates question whether CBP even has the legal authority to make asylum-seekers wait; US and international laws guarantee their right to seek asylum. These days, that right is only as durable as their ability to withstand heat, hunger, and isolation at the border crossings. That’s where Cañas Aguilar comes in. When asylum-seekers do make it across the bridge, their journey is far from over. Many are put in immigration detention while their claims are reviewed. The process can take months or years. Between 2012 and 2017, judges granted asylum in about 50 percent of cases. 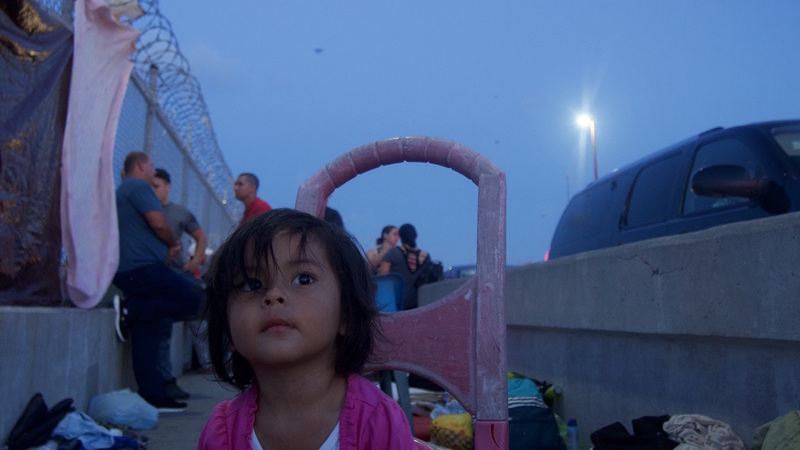 Two-year-old Jennifer waits with her mother on the B&M Bridge. 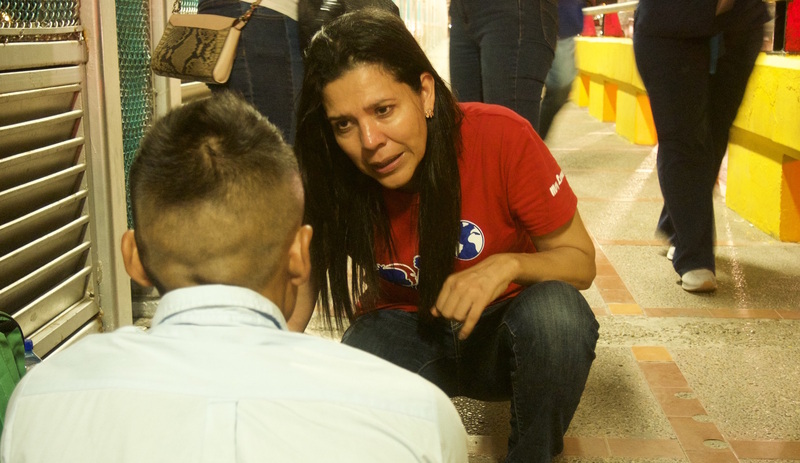 On the sweltering day when Luis Miguel Montimo is weighing his future on the Gateway Bridge, a Cuban woman with a severely sunburned face is lying on the B&M Bridge in apparent exhaustion when Cañas Aguilar and her daughters, Ingrid, 24, and Ixchel, 19, appear. They assist the 10 or so people on the bridge and, with the efficiency of a pit crew, sweep up and make sure the camp looks presentable enough to prevent passersby from complaining. When a driver arrives with supplies, Cañas Aguilar hops over the concrete traffic barrier to pick up electrolyte solution and powdered milk. Four days later, things are busy on the Gateway Bridge: More than a dozen people have recently arrived. It’s a mercifully cool night, and the campers are joking and carrying on. Montimo is among them, but he’s not part of the banter. He is now accompanied by his girlfriend, Ingrid Perdomo, who traveled north with him and their son but initially planned to enter the United States separately. Once again, they’ve been turned away by CBP. “I won’t leave you alone,” Cañas Aguilar says. “Don’t be afraid.” She asks for a hug, then comes back for another. Montimo’s son is sprawled out on a blanket next to a blond teddy bear. Montimo wipes his eyes and nose on his jacket, and after Cañas Aguilar walks away, he lies down with his family for the night, a few short steps from the United States.